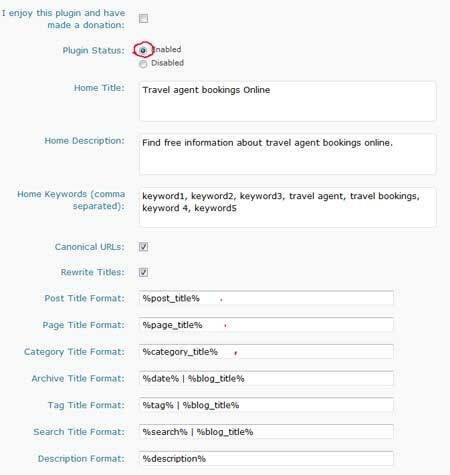 WordPress tutorial how to set up or configure all in one seo pack wordpress plugin option settings for your blog and for your blog post. After i posted the best wordpress plugins or widgets, and how to activate your akismet api key tutorial, today this post will digg more on how to set up all in one seo wordpress plugin. There are tons of seo plugin for your wordpress blog. Either free or paid version, but to me, all in one seo pack is the best, and very easy to use. All in one seo pack, is the most important plugin i activate right after installing wordpress. To configure the settings, we should not be confused between, configuring for our blogs in general, and configuring the option settings for the post, as they are completely different. Note: If you are using Twenty Ten theme of wordpress 3.0 you may want to check this tutorial first before you follow these steps. 1. Admin dashboard/Settings/All in One SEO. 3. Home Title: Basically the same as your blog title which can be found in Admin/Settings/General/Blog title. 4. Home description: Describe your what your blog about, but not too long. 5. Home keywords: Type in your keywords and it should be done after you doing some researches, find more how to do keywords researches here. 9. Untick “Use no index for Categories. 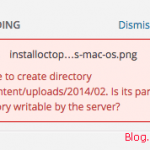 Except if you have a few wordpress posts, then you may want to consider ticking this option. Whenever you write a post, writing excerpt is a good idea too, because it’s avoiding duplicate content if we set to index our categories. See more in this post about when you need to use index or noindex in WordPress category. If you are not sure, “untick it” or feel free to contact me. 10. Tick “Use noindex for Tag Archives. 11. The end, but very important, click “Update Options” button. 1. Scroll down, all in seo pack is in the bottom of your post’s page. Title: Copy and paste the title of your post. Keywords: your post keywords. If you need a guide how to choose keywords, you may want to see more here. I am using All in one SEO for my blog and its working great . Thanks, for the tutorial it will help others lot. Kept asking my self which is better? It really depends on how long is your blog title, example, if you have a pretty long blog title, I personally think only post title is better. And also depends on the topics you want to blog, if you have “travel” blog title, and in the middle of blogging you want to write another topic, the travel blog title will look odd. All in One could use some work. Sometimes fails on its face, and that’s one plugin I don’t need faltering when it matters most. Thanks for the great tutorial! Quick question: if I install AIO, will it automatically change the permalink structure for my already existing posts or does it only effect future posts? Or will it help redirect if I choose to change the permalink structure through the basic wp settings? @Adrian, Hello there 🙂 AIO has nothing to do with permalinks settings of your blog. AIO will help your blog what to show in Google or other search engines result pages, for the titles and descriptions if the keywords you choose is what the surfers typed. If you just installed AIO now, i recommend you update all of the post title, and description, it won’t affect anything if the title as same as your post title. But changing permalinks will affect your SERPs. I noticed from your blog, you still have ?p=486 permalink 🙂 It is not friendly for search engines at all, you might want to change this permalink to more search engine friendly, see more in this post: https://www.wpvidz.com/how-to-change-permalinks-wordpress/ before you have more posts. But be sure to backup everything and read the guide from wordpress.org official website first. @Kimi, Thank you so much for the great info! I’ll be making these changes tonight for sure! @Adrian, You’re most welcome 🙂 Take your time and good luck. @Kimi, sorry one more question! About the backup, I’m hosted on GoDaddy, and I know they backup my site nightly. Would you recommend still backing everything up if I haven’t made any changes yet today? @Adrian, Yes, we should backup our wordpress database regularly for the safety. I use wp db back up plugin. Hi Kimi, AIO is great and your tutorial was SOOOO helpful in getting it set up. I also changed my permalinks and everything went well with one exception. The links on my home page to the archived pages (in the boxes and numbered) don’t seem to work. Any ideas? Thanks for the tips. Only 1 question how to add to the title the child (or parent) category if i have multiple categories. All In Seo Pack enable us to optimize our post title, independent from Category (or Child Category) Title. 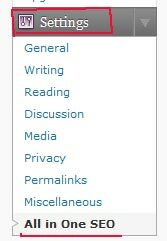 I agree that you can edit the title in the categories area of the wordpress admin, but if you do that it also adjusts your URL. I’m looking for a way to adjust the title while still leaving a shortened category URL. all in one seo is great but is there option to set categories title manually??? @fari, Thanks! The informative post is more important to me. 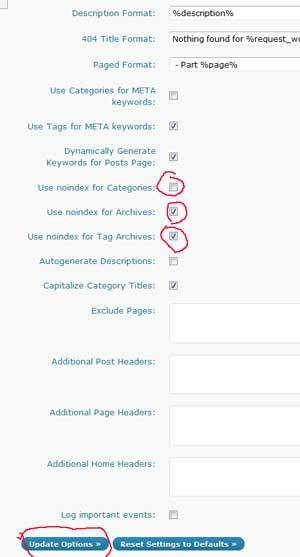 For steps 6,7 and 8 why should we delete %blog_title%..
Also for those steps would adding %blog_description% help any? The reason why i did remove my blog title is, because i have a long blog name which is Free Video Tutorial | WordPress Getting Started. 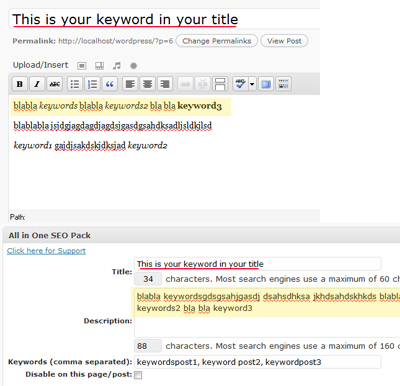 If your blog name contains your keyword, you can have %blog_title% on. If you use %blog_description% your browser title would be really long, because usually we describe our blog, it would be more texts than your blog’s name. This is why even in default settings, you would not find any %blog_description% in any settings. Thanks a lot, helped a lot! How can I write seperate titles for each categories. This is just taking the name of the category as title. Please advice. Unfortunately i have no idea how to do that, i am not even sure if it is possible. I suggest you to ask wordpress support. i installed all in one seo pack but i didn’t see the save option (update settings) in admin page of all in seo pack ! its strange! please can anyone have any idea clue what went wrong ? That’s very strange. Try to delete the all in one seo pack plugin, and install it again? Or disable all other plugins, and then try. Thank you for your reply. I sorted out above problem. There was an option shown in the settings section in ALL IN ONE SEO PACK which was “update your database (backup your database before update)”. I didn’t update my database yesterday and thats why I didn’t see the “update settings” option! Just few minutes ago I clicked the “update database” option and now I seen the “update settings” option. Glad you solved it, thumbs up! Does anyone knows how to add Title, meta description and keyword to a particular page which should override the default AIOSEO settings for page which is (%page_title% | %blog_title%). I’m so glad you have a post for this too! But I cannot get this to work. My site is pretty basic and like I said it has no other plugins so I cant see how it is conflicting with anything. I have checked your site, i can’t really tell why that happened, because i need to be in your dashboard and see how you set this plugin up. You will be landed to the post which has title: Welcome to Midlands Drum Lessons by Philip Guest. This can be Search engine optimised, by changing the URL which has keyword in it. Here is a link to the ALL IN ONE SEO plugin options settings page in my dashboard. I have checked the pic, it should be working, or try with more short title. No, it doesnt work I’m afraid. My header.php file looks like this. * Print the tag based on what is being viewed. All in one seo pack plugin has nothing to do with your header.php, however when it is installed it will be shown in the page source. I notice you deactivate the plugin. If you follow the tutorial correctly it will work. But whatever I change the title/description etc to it does not change anything. Unfortunately no idea. All in One seo pack plugin is exetremely easy to install and configure. I’ve uninstalled it it and re-installed it and followed your post exactly and it still doesnt work. Again I stress that I am able to write next keywords etc but it is NOT updated on my website pages. This is really very important for us who are related with…. Thank you!! I could not figure out why all the pages EXCEPT my home page were showing the All in One SEO tags and titles. You saved me from an expensive call to my web developer who did not set this up correctly….urgh!! Thank you SO MUCH for this guide! It’s seriously the best one I’ve found, and I’m so glad you alerted me to the All-in-One SEO Pack options for individual posts! I’ve been completely ignoring it since I didn’t know how to configure the plugin. It’s so nice to catch this before I have hundreds of posts to go back and update. You are awesome! Most welcome, Thanks for your nice words! I cannot stop reading your blog posts LOL. I have about 10 of your posts open right now in different tabs of my browser so i can make sure I read all of the ones I find interesting. Thanks a lot, you do a good job. Very helpful tutorial! AIOSP is very good from SEO point of view and by this tutorial you make it easy for people to learn! Thanks for the tips about getting AIO setup. I’m trying to work on getting the post title to show up across the top of Firefox or IE, without the blog title showing up as well. I can’t get the all in one seo plugin to work. I tried waiting for the site to be crawled and it still does not work. Does it have to be crawled by Googlebot or is it another type like does a google site map have to be submitted? What do you mean by “I can’t get the all in one seo plugin to work”? Do you mean, All in One SEO is configured but your site is not yet crawled? If yes, you would need to build links, to get your site crawled faster. I wrote SEO tips 2011 I have done those tips all, and my site is indexed a few minutes after I hit publish button. But it took me a year to achieve it, many people can gets it faster but I prefer the slow but save one. SEO can’t be done instantly, it needs time. Hello! I am from Kiev (Ukraine). It’s wonderfull web site! The information is great. But I have one problem with All In One Seo. How to put “meta name=”description”” after “” ??? Unfortunately I can’t see the source code here. Perhaps you upload it somewhere in a txt file. But it is also depending the theme you are using..
Why my comment does not published? Your comment is awaiting for approval, every comments on this blog are in hold before they are published. By the way, The code you typed did not display correctly, it is best to give me the link of your blog, and I will take a look. Sama-sama. Yes, they use Tagalog 🙂 there, beautiful country! Thank you so much! I couldn’t find anyone to tell me how to get rid of the blog title at the end of my post title. It was making my titles too long in the search results. I asked several experts, and no one could tell me. Thank You! You explained very well. Please visit my blog and see the full source page. I have already added meta description and keywords to my blog header page. Should i remove that before using All in one Seo Pack. I have checked your blog, and if you are thinking about using All in One, then you can copy and paste the meta descriptions and site title, etc in a notepad, then paste them in AIO settings. However if you have lots of pages and posts this can be time consuming.. Though I guess you will loose traffic for a while until your blog is updated.. Thank you so much for the great post. I followed the link through to your tutorial about setting index or noindex for Categories, and it cleared up some confusion I’ve had about that for some time. I’ll be sure to visit again! Niche wordpress guide ! Thank for your tips..
hi, I just added this plugin and activated it. I am wondering how long it takes to see my website in search engines? I can’t see any of it so far! The site is at StockPrices.net and The part of the view source I’m worried about looks like this. Please explain how to fix this. Can you see a way to fix this? Thanks in advance for ANY tips! I have those problems before, so I set “nofollow” to the tags in my blog. About problems in Google webmaster tool, I actually wrote a post about this problem too. It takes a while until Google webmaster tool to update your data. Thanks for the quick reply! Can I still have blog comments and links as dofollow or does the whole site become nofollow? Can you explain how to set nofollow to the tags? Blog comments and links are by default “nofollow” unless you install dofollow plugins. If you use Firefox, here are my SEO plugins (https://www.wpvidz.com/seo-firefox-addons-my-top-3-seo-firefox-tools/) so you can check whether the links in your blog are nofollow or dofollow. To set nofollow (and noindex) to the tags, in All in SEO settings, scroll down, until you find, “Use noindex for Tag Archives”, make sure to tick it off. Anyone know what to use between the for all-in-one seo, i have everything working except the description is not showing. Any help will be much appreciated. Anyone know what to include in between for all-in-one seo, everything works except description is not showing.. Anyone know what to include in between for all-in-one seo, everything works exccept description is not showing.. I just want to ask, why do I have to delete the |%blog_title% in the post title format, page title format and in the category title format? Thanks for the share. I hope to get a reply from you soon. Thanks for the info, helped me out a lot. Very very help post .Thanks for sharing with us. Thanks for the great tutorial on wordpress and the seo plugin! I think that one works exstemly well. Also great info on changine permalinks. I find seo wordpress to be one of the easiest things to do to please google! I’ve uploaded this plug in but don’t know how to configure it. Thanks for this post I’ve configured it already. Hope this will work on my website. Keep posting! I am using AIO. It was working fine before updating to WordPress 3.3.2. But after updating it is not showing Home page Title (defined in AIO). Thanks for the great info Kimi. The step by step is great. I have configured the SEO pack as you instructed. When I go back to my dashboard, I am still getting the pink bar that tells me it needs to be configured. Any suggestions? It’s possibly caused by your privacy setting (Setting > Privacy) and check if you let search engine crawls your blog. wow, Really nice presentation:) but pls tell me why don’t we uncheck “Use Categories for META keywords” ?? This post was made long time ago, and SEO these days are frequently changed. Therefore, I recommend you to test things out and apply which works for you, which don’t. I prefer to disable the “Use Categories for META keywords” option, because I don’t want my categories to be the keywords of my posts. Yay, I’m still undecided if I’ll use all in one seo or wordpress seo in my new blog. WordPress seo works fine so I’m a bit skeptical about all in one seo. Any recommendations? thanks! Thanks for the setup tips! My blog is a few years old and I haven’t used this yet, should I go through and update my old posts with it as well as the new ones? I would just apply it with your new posts, and let the old one as they are. thanks for this useful post i am using this plugin on my two websites and it worked fine.. Finally i got to know why i was not ranking! I did’t enabled my plugin afetr updating it. First of all i want to say you have written nice & informative post but I still have three queries. 1.I have too many category for which i would like to write title for each category how can i do that? 2.I want to write description on the basis of my categories such all my post under one category show same description when i view “view page source” .How can i do this? 3.How can i assign keywords to my categories? I m stuck so, please reply soon. which one is best all in one seo or yoast seo plugin ? Hi Maddy, to me, at the moment it’s Yoast.